A how-to guide for the considerable task of looking cool while owning the Microsoft Kinect. But nothing is that simple. Microsoft’s attempt to allow and encourage us to “be you” was akin to telling an advice-seeker to “follow your heart”: it sounds great until it’s attempted, at which point it results in a number of awkward and debilitating missteps. Kinect is like a spotlight glaring at us when we’re least ready for our performance; it’s a way for technology to actively judge us by allowing us to judge ourselves. Kinect will be seen by human history as one of the greatest acts of emotional terrorism against humanity by passive, not-quite-sentient machines. I bought a Kinect a year ago with high-hopes, and the Kinect betrayed me. I anticipated a seamless integration into my living room that would improve not only my video games (with occasional well-integrated motions and voice-commands), but my everyday life. Instead I found myself living with something wholly other than both myself and the other electronics in my house. Here is my struggle, from the very beginning. Setting up the Kinect takes a small amount of time connecting cords into things, and a significant amount of time standing around and posing in front of your Xbox 360. 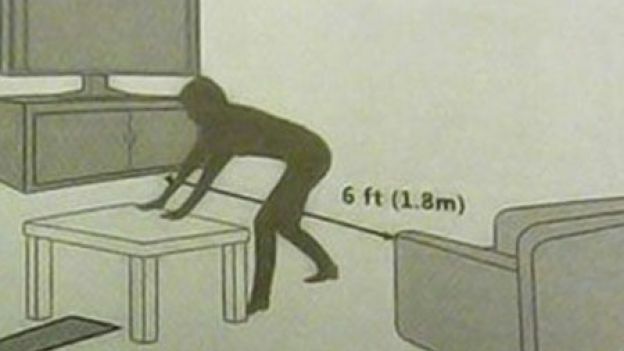 Do not plan on carrying out this process on the front-end of some kind of Kinect-centered get-together. The set up process involves waving at the Xbox as if it were a real person, standing at a reasonable distance, moving forward and staring deeply into our television’s mechanical soul, holding up a picture of a creepy robot smiley-face, stepping left, stepping right, reciting a pre-ordained sentence, and confronting your own self-concious desire for a different life than the one you have. We do not want, or need, an audience for these steps. Remember that your Kinect is not in any way sentient, nor is it transmitting its observations to an unknown location in Redmond, Virginia. Admittedly, these things are very real possibilities, but it’s crucial that we agree nonetheless that they are impossible. Otherwise, we’ll feel the need to put on clothes, comb our hair, and wash our face just to start up Netflix. The Kinect doesn’t go out of its’ way to hide its judging eye from us. Sit on the couch in pajamas and a dirty t-shirt, power on the Xbox and watch in awe as this device awakens, checks us out with a sweeping vertical motion, and glares at us disapprovingly. A box in the lower-right corner confirms the device’s silent assertion: we are a disappointment. We can blame the surreal color and grainy image quality all we want, but the truth is, this is probably the most accurately representative image of our general condition we will ever encounter. 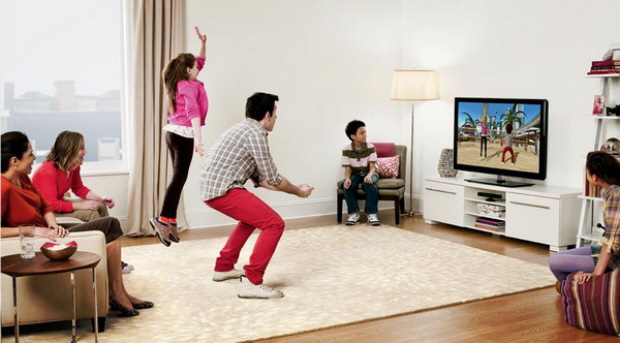 Just as we were at the time of purchase, the Kinect was anticipating groups of friends in a brightly-lit, spacious room, gleefully dancing and swatting at the television. The truth is that most of our time with Kinect will be solitary and low-key, passing the time by watching reruns of Hoarders while trying to keep from spilling store-bought salsa on our shirt. Our Kinect expected better. The only consolation is that we’re able to boss it around. It’s possible to feel silly exclaiming “Xbox PLAY!” but it’s a good idea to own it, to show our Xbox who’s in control of the situation. We may appear to our game system to be a non-starter, but who’s calling the shots now? Speak forcefully, without any hint of weakness and Kinect will respect us. There are a few Kinect games that we were meant to play alone by standing in your living room and miming different actions. These games are all cruel pranks. They are messing with you. Don’t fall for it. They will make you feel stupid for not being able to high-five correctly or pull levers. Or they will insist that it makes perfect sense to walk around by holding up your right arm. You will find yourself thinking things like “Man, my right arm is tired from walking around so much,” which is a sign that video games are stupid. Kinect is trying to force you to acknowledge this undeniable truth. That’s mean. Don’t let the Kinect win. Trade in Steel Battalion immediately. Sell Rise of Nightmares on eBay as soon as possible. We may be anxious to justify this purchase by actually using it, but forcing the Kinect on the unwilling is a mistake. It may be possible to force a self-conscious or reserved guest into doing dance moves or manically slicing fruit, but the end result will inevitably be a let-down. Just play a board game. When guests are on-board with the idea, our job is as facilitator of a fragile kind of fun: Kinect may seem fun, but it has the potential to spiral out of control at any minute if not handled carefully. As the host, it is your responsibility to take the first turn. It is much better to demonstrate the appropriate way to play a game than to be forced to yell various commands at your guests in the heat of the moment. Odds are, you will still feel obligated to help your guests. When coaching them through the strange experience of “being the controller,” don’t shout. Speak gently, with a confident assurance. Sound pleased – make them feel as if they are doing fine, even if their avatar is flying across the screen and bending in unnatural ways. No one likes to feel as if they are being berated while squatting repeatedly at the floor or trying to pull off the cabbage patch. Seating arrangements can be tricky. While the tech may allow you to sit behind someone who is playing without messing anything up, actually doing this can seem too much like something an opportunistic creeper might do – the only view you will get is one of the current player’s backside, and during a game of Dance Central this is particularly unfortunate. If you must sit, fan the seats outward from the sides. Really though, it’s best to just stand. When playing simultaneous multiplayer, try not to hit one another in the face, but don’t go out of your way to avoid one another either. The game is trying to bring you together. When you finish playing, you’ll act as if none of this has happened. For now, in the midst of this arm waving and posing, all pretenses evaporate. You’re just being you. Richard Clark is the managing editor of Gamechurch, the editor-in-chief of Christ and Pop Culture, and a regular columnist at Unwinnable. Where are the credit for using my photograph? The lead photograph was linked at the bottom of our post, under “art credit”. If that isn’t sufficient, please email info@bitcreature.com and I will happily make the edit for proper attribution. It’s a great picture, and I want to make sure it gets its due.